It’s interesting to see the dichotomy between Q4 2018 GDP growth and Q1 2019 growth. Q4 2018 seems like an easy to predict quarter while Q1 2019 looks like a mess because of the government shutdown. 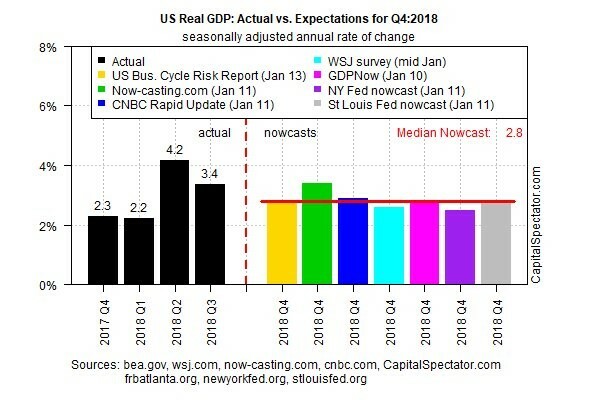 As you can see from the table below, the estimates for Q4 GDP growth are all very similar. It’s rare to see such close estimates. Lately, the NY Fed’s forecast has been very pessimistic, while the St. Louis Fed’s forecast has been very optimistic. They differ by very little as of January 11th. At this point in the quarter, the Atlanta Fed GDP Now reading is very accurate. It’s highly likely the initial GDP report shows growth between 2.5% and 3%. Economic growth slowdown is very easy to see as Q2 growth peaked at 4.2%, Q3’s growth was 3.4%, and Q4’s growth is about to be around 2.8%. Q1 GDP growth is likely to be below Q4’s growth rate which means the slowdown trend will continue. There isn’t much economic data from this quarter yet. We have the headwinds which are the end of the benefit of the tax cut and the global slowdown that’s clear in Europe and China. Industrial production was down 3.3% year over year in Europe which is the largest decline since December 2012. That was the end of the European recession in 2011-2012. As of January 11th, the NY Fed’s Q1 2019 GDP growth Nowcast is only 2.11%. This doesn’t even include the weakness caused by the government shutdown. If the shutdown hurts GDP growth by 0.15% per week and it lasts 3 weeks, the current Nowcast should show growth of only 1.66%. PPI-FD - Bulls will say this is temporary weakness. This could be a relatively weak report compared to the past few quarters which is made much worse by a one time event. Personally, I’m betting the shutdown ends before government employees, who are working without pay, are set to get paid again. They missed their first check on January 11th and will miss their next check on the 25th if this situation isn’t resolved. There’s no way politicians will let workers miss another paycheck. Some government workers are relying on credit cards to make ends meet. Workers at the IRS, TSA, and DHS have clicked on indeed.com at a 17% higher rate because they are worried they won’t get paid. Interestingly, an unnamed White House official stated the GDP effect of the shutdown is double what the White House initially stated. The effect was changed from 0.1% per 2 weeks to 0.1% per week. Regardless of what the government tells us, the effect has always been between 0.1% and 0.2% per week. I said this is interesting because the White House doesn’t want to promote how problematic the shutdown is because it’s partially to blame for it. Producer price index’s measurement of inflation was weak in December as month over month headline inflation fell 0.2%. That missed expectations for no growth and 0.1% growth in November. This was the first decline since February 2017 and the largest decline since August 2016. On a year over year basis, headline PPI was 2.5% which was the same as last month. As the chart below shows, month over month core PPI was down 0.1%. That was below the consensus for 0.2% inflation and less than last month’s 0.3% price gain. Core PPI was up 2.8% which was a slight increase from last month’s 2.7% increase. Finally, when you exclude food, energy, and trade services, month over month inflation was 0%. This missed estimates for 0.2% and last month’s reading of 0.3%. 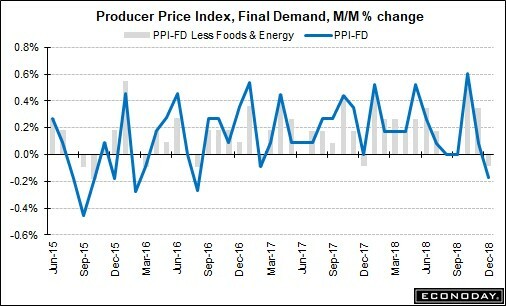 PPI-FD - As you can see, producer price inflation was tepid. This further supports the idea that the Fed should pause its rate hikes. Even if economic growth was accelerating, I would see no reason to step on the brakes with inflation weakening. The most important takeaway from this report is core inflation was weak. This means oil wasn’t the only reason inflation was low. Specifically, energy fell 5.4% in December after falling 5% in November. Total services prices fell 0.1% and trade services prices fell 0.3%. Personal consumption was down 0.2% and finished consumer goods fell 0.6%. Food price inflation was strong as it was 2.6% in December after increasing 1.3% in November. The cost of healthcare services was up 0.2%, and healthcare prices were up 0.1%. For almost this entire business cycle shelter inflation has been the driving force of overall inflation. With the weakness in the housing market, that is starting to change. It is still driving inflation, but less so than 18 months ago. As you can see from the chart below, rent of primary residence inflation has fallen modestly. On the other hand, average hourly wage growth has been accelerating. This means the largest gap between the 2 since the 1980s has shrunk. It’s amazing to see that even during the housing bubble there wasn’t a large gap between rent of primary residence inflation and wage growth. The latest decline in rent inflation is similar to the decline in owners’ equivalent rent inflation. One interesting phenomenon is that New York is the state losing the most population because people are moving to other states. I mention this because of the high rent and housing costs there. New York didn’t experience a housing burst like the other hot cities such as Seattle and Las Vegas this cycle, but high housing costs are still an issue. The point here is that if people move away from expensive cities, they experience less shelter inflation. In this case, inflation is a choice. Q4 GDP growth is pretty much a lock to have a 2 handle. 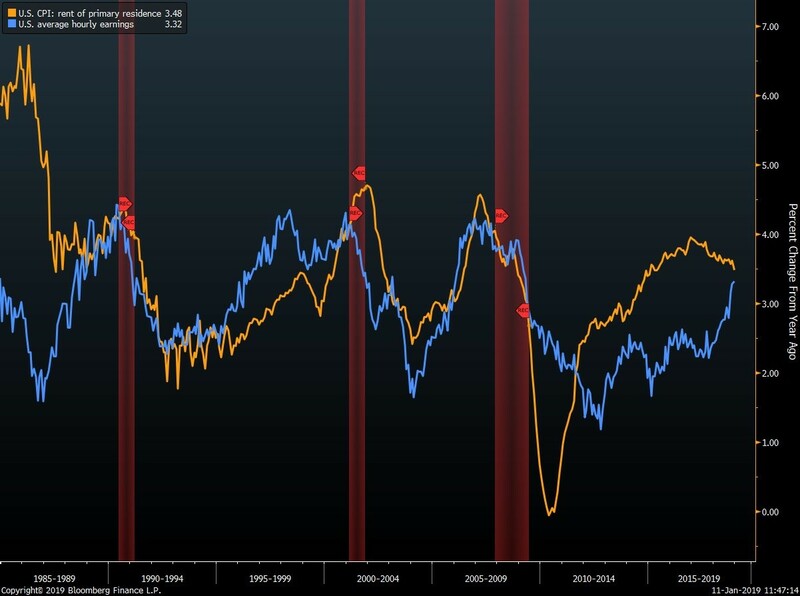 Q1 2019 GDP growth could be a disaster if the government shutdown lasts much longer. It’s tough to get an idea of how strong growth will be in Q1 because some of the data is delayed and it’s early in the quarter. The only facet we know for sure is the government shutdown will put a major dent in growth. Inflation has fallen which means the Fed should be dovish at its next meeting on January 30th. All your articles and weekly reports are outstanding in presentation and facts. I have and continue to learn a lot about the business of trading. Your organization is absolutely at the top.Thank you again.